Dream catcher, Blue sand stone, Necklace ----------------------------------------------------- 【Dream catcher series】 Dream catcher - Pray for peace and bring good luck. Can expel nightmares and bring dreams. <Use manual packaging.> <You can choose the size which you need from the drop-down option.> *The end of the necklace will be paired with a natural stone. It will be paired by designer. 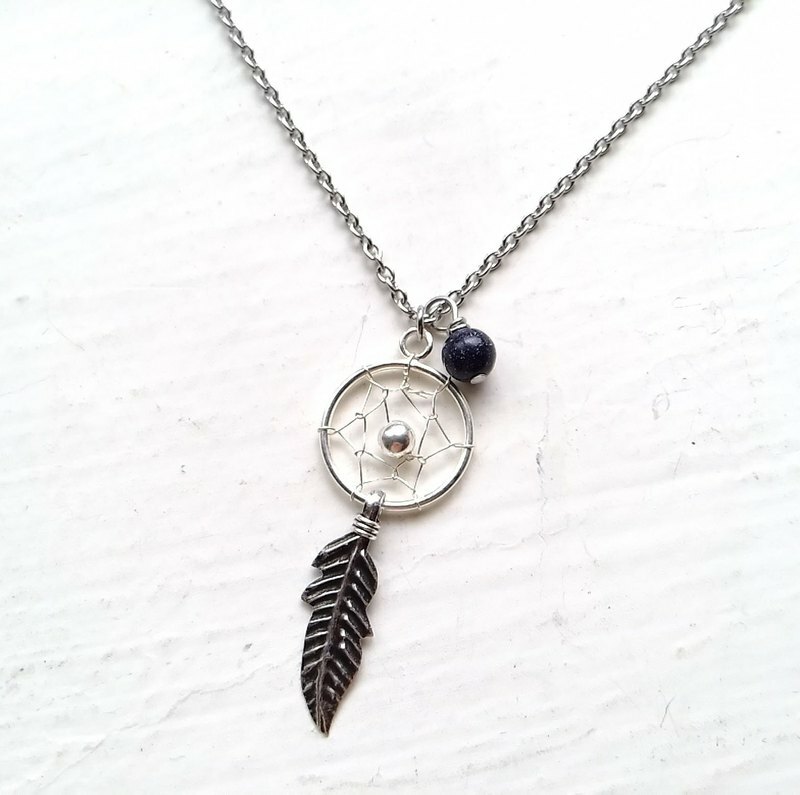 *If you need to replace it with 925 silver please additionally purchase this product: https://www.pinkoi.com/product/uBKb6Ysf?category=2 ★Material: Necklace: Stainless Steel Dream Catcher(Diameter of the circle: 8mm): Sterling silver Natural Stone: Blue sand stone ★Size: 40cm/45cm ★How to use and how to maintain it: ▶Do not wear in hot springs. ▶Metal material (gold, silver, copper...), exposure to water, sweat, cosmetics, chemicals...etc. for a long time, may lead to oxidation and discoloration. Wipe with a silver cloth to restore the original luster. Brass/red copper can be wiped with copper oil or brushed with toothpaste to restore its original luster. ▶Do not wear plating alloys in the bath and in the hot springs. Exposure to water will accelerate the speed of the oxidation and fade, and the product will not recover after discoloration. ▶Use tissue or wipe the cloth with water. ★Precautions: ▶Do not wear in hot springs. ▶We hope you like tour natural stone, because every natural stone is different. ▶Because the size of the materials to be produced is different, for example, each size of the muti-faceted natural stones is slightly different, so the total length of the product may have size error of 0.1 to 0.3cm, which is not exactly the same as the length and dimension select at the time of ordering, and the arrangement will be slightly adjusted according to the length. ▶All items in the image may have color differences due to factors such as light or resolution. ▶Because the goods are handmade and according to the size and materials you choose, so there is no stock available for replacement, please make sure the size you choose is correct, because there is no replacement service after the subscript.